You are a master of the matirial arts. Quietly confident that your skills will allow you to overcome any challenge. Even the greatest challenge off all - THE WIZARDS TEMPLE!! Remote and heavily guarded, the temple is a fortress never before defeated. 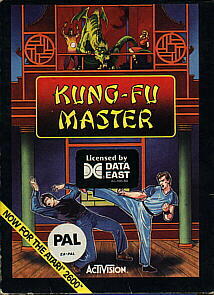 You must avoid demons, dragons, snakes and killer bees while doing battle withe the wizard´s armed henchmen on each of the five floors of the temple. Beware lapses of concentration - you must defeat all of these deadly guardians and more to advance to the next floor. Failure is out of the question - the wizard holds the princess captive, and only you stand between her and an uncertain fate. 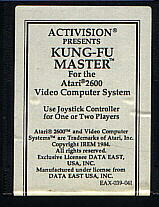 The one thing you can be certain of is non-stop martial arts action with Kung-Fu Master.